This course is perfect for individuals who want to get hands-on with upcoming technologies with the guidance and support of experienced teachers. You will be tackling and discussing real-world problems and tasks. With visits and talks from experts in the field, you will get insights into the world of research and industry, hearing first-hand how to set up your own company or design a product used worldwide. The school provides packed lunches for all students during the week. At weekends lunch is provided by hosts. Get to know Marty through a build where you will be introduced to the different parts that make up a walking, programmable robot. We will cover some of the different programming concepts and best practices for programming a robot. What are robots? How are they used in society and why? Discussion and activities to uncover some real-world problems surrounding robotics. Using CAD software, we will design our own robot part specifically for Marty. In groups you will have a full day to design and program a solution so that Marty can navigate and solve a maze by considering where sensors should be placed and how Marty will decide which route to take. With a keynote from the founder of Robotical followed by judging of teams maze solving solutions. Afternoon trip to experience different robots first-hand, find out what they are used for and look at how the field of computing has developed. Introduction to the programming language, Python, that we will be using to explore creating and programming small games. Either individually or in a small group, you will begin to design your own Marty game by planning out the different elements of the game and procedure before starting to develop using Python. Continuing on from Thursday afternoon work, incrementally develop and test the game before preparing to present to the class. End of course presentations and awards, reflecting on the week. 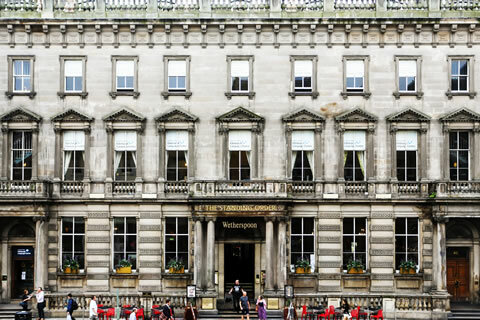 Our Edinburgh school is situated in an outstanding central location on George Street. Offering panoramic views of Edinburgh Castle to the south and looking out over the elegant buildings of New Town to the north, the school is in the best location from which to explore this beautiful capital city. With a dedicated young learner team on site, the school offers fantastic support and facilities. Staying in a homestay, you will have the opportunity to practise English in real-life contexts. Always friendly and welcome, our hosts come from diverse backgrounds and will look after you well during your stay in the UK.